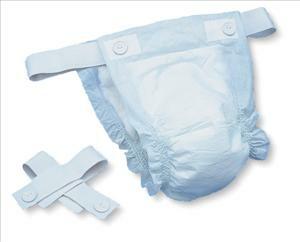 Discreet and comfortable, the thin design creates less bulk under clothing. Super-absorbent polymer improves dryness, containment and skin care. Extra-wide belts are secure and comfortable. Cloth-like outer cover is comfortable against skin, helping to reduce the risk of irritation and rashes. 120/cs, 30/bg. Each bag includes 2 sets of belts.